Young Dwight McNeil took “a real step forward”, admitted Sean Dyche, after earning a standing ovation on his first start for the club against Olympiakos. The Rochdale-born 18-year-old came in for the injured Johann Berg Gudmundsson and delivered a hugely encouraging performance. 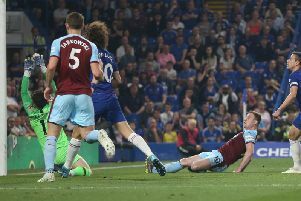 Dyche was thrilled with the youth product’s impact, having scored the winner in pre-season at Preston, and also enjoyed an impressive cameo in the second qualifying round second leg against Aberdeen in extra time at Turf Moor. He said: “Fantastic, he’s done ever so well. “He’s been around us for a while, end of last season, beginning of this. “I wanted to get him involved more really, but it was about finding the right opportunity. “For a young player, we’ve done well to leave him along because you can get involved and over coach. “The message tonight was work hard and enjoy yourself, simple as that. “And I thought he did. “Massive achievement for him to play in a tie like that, pleased and proud for him and his family as well. McNeil recovered from giving the ball away early on, to allow Olympiakos to break, showing good character to shrug that off and still make a big impact: “I think the players support each other. “They’ve seen the quality he’s got in training, and we’ve got a group who care for each other as a team. “They got around him quickly, Jeff (Hendrick) gave him a high five and said to keep playing, be steady, and he did. “But these are all the learning curves young players have, brilliant for him tonight. “He did great against Aberdeen, and again tonight, and each time that experience level goes up. “That little bit of believe gets added, and we hope he grows more belief from tonight. “It’s early days, but we do like what he’s doing. And he’s there on merit.